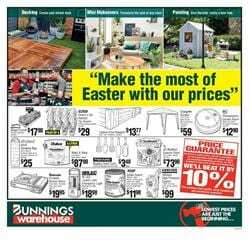 Bunnings Catalogue April 2019 power tools, gardening tools, new price drops and a lot of warehouse deals that you can currently shop for the new prices. This store is one of the few biggest hardware retailers in Australia. They publish a catalogue on a monthly basis. Sometimes more than one for special days like Fathers Days because there are nice gifts for fathers in the product range of Bunnings. Power tools including drill drivers, grinders, combo kits, multifunctional tools and their parts are major categories in the catalogues. Moreover, the catalogues are not only for selling something but also they teach people how to handle problems with DIY projects. Fencing, decoration, furnishing are only a few of the actions you can learn from the squad and online publishes of the Bunnings. Also, they have a Youtube page where you can find videos for those how-to subjects. In this page, you can always browse the latest catalogue and read the reviews. Bunnings Warehouse sale, online price drops, and all the updates will be on this page. Follow our social media accounts on Facebook and Twitter to get notifications. Alternatively, you can subscribe to CatalogueAu.com for notifications through your browser. Encounter great deals on products that will enable and help you caring for your garden when the seasonal changes occur. Browse the top brands of hardware and power tools with an excellent wide range. Get ideas to do your works properly with utmost precision. A professional squad, years of experience, a unique understanding of retail are all combining to construct the content of Bunnings Catalogues. You will see a lot of new Easter deals on the latest one. One of the major parts of the catalogue content is the paints and painting tools. Arlec, Karcher, Dulux, and many more brands of various products that can be present in the stocks of a warehouse. Paint your fences, walls, interior or outdoors. British Paints, Dulux, Taubmans paints are on the spotlight. Browse a great range of products including spray paints on pg 2. Bunnings offers protect and anti-bacterial paints on pg 3. Weathershield 6L exterior paint will cost only $89.90! Find special Easter things at Bunnings this week. Learn how to make a bunny planter with D.I.Y. Advice video by Bunnings. Their Youtube channel is very active and regularly upload useful videos. Shop Spray paints, exterior paints, and more on pg 4. Shop Ryobi, Cyclone, Ozito, Victa, AEG power tools and more brands at Bunnings stores this month. Remember that it's very safe to buy something at Bunnings Warehouse because they have guaranteed lowest prices. Trimmers, lawn mowers, gloves, super rake, and more items are available on pg 6. Get a super rake for $22.95 at Bunnings. Finish your works of gardening with ease and simplicity. Lawnmowers of Ozito are precise and powerful products to make your grounds look stunning. Check the reviews on these products and visit Bunnings store to see products like Ozito 18V Brushless lawnmower kit priced at $199. Bunnings Catalogue also has line trimmers. Ozito 500W line trimmer is $49 this month. Shop for blower vac kits, too. Skins for trimmers are also in the tool range. This part of the catalogue also offers hand tools and safety products including leather gloves. Pay only $24.98 for the leather gloves that are perfect not to cut yourself while pruning. Hedge shear, spade, fork, kneeling pad, and more are in the range. Subscribe to the newsletter to get emails about the deals. There is also nice outdoor furniture collection on the Bunnings Catalogue. BBQs, firepits, patio heaters, and more can also be choices for your backyard. Don't miss out the latest catalogues by Bunnings. Find garden hose, garden bed, potting mix, and more power tools on pg 5-6. Many more categories, tools, gardening products are available in this catalogue. Don't miss out anything on the future Bunnings Catalogues, follow our Facebook page and get emails via a subscription which is free. You are browsing the correct catalogue find a decking product or a proper assistant from a professional squad. You have deals on treated pine sleepers, concrete sleeper, galvanised nails, and more products in this part of the latest Bunnings Catalogue. You will get what you need for your DIY project with the help of Bunnings catalogues. They have great offers and guaranteed lowest prices. 20kg rapid set concrete is only $7.15! Make it a solid structure with this fine piece of concrete. You can make a pool fencing with glass fence panel, stainless steel mini post, glass pool fence, and more. Also, a garden bed is not a big deal with concrete sleeper and joint posts. Your garden will be like heaven with these adjustments. Find more raw products on pg 15. Acacia laminated panel, MDF, Structural plywood CD, Formply F17, Pine lining, and much more than this can be easily spotted on your Bunnings Catalogue. Ask the squad for help, they will be great support while you are shopping. They can also help you with technical issues. And don't worry about the prices since Bunnings has the lowest price policy. They will beat any possible lower price from elsewhere. Solve your power problems with extensions, 6 outlet powerboards and enlighten your working place with powerful LED lights. Get these products at Bunnings for lower prices in March. Guaranteed lowest price is a very popular offer by warehouse stores like Bunnings. This Bunnings Catalogue is a practical tool to find all categories with highlighted offers in a single place. In the electrical category, you can also find cooling products like fans. Euromatic 30cm desk fan has 9-speed settings, remote control operation, and basic design. If you have a small place that needs to cool down a bit, this product might be very useful. Buy Solar LED bollard light for only $11 at Bunnings store. You can stock Energizer, Eveready, Duracell, Varta, and more batteries in packs. Secure your home with door openers, insect screens, fire extinguishers, smoke alarms. You can get help from home security workshops. Rectangle dolly, galvanised nails, panels, and more decking products are also available on this catalogue. Waterproofing membrane, roof vent, combo kits, and more are major products in the end of the Bunnings Catalogue March.